Businesses of all sizes are adopting Cyn.in to enhance organizational performance and drive success in an intensely competitive, connected economy. While technology is only one part of the what makes Enterprise 2.0 useful and relevant, designing strategic practices for deploying it in the enterprises, providing guidance and training, ensuring widespread adoption and driving positive business results truly propels these technologies to success. Download the pdf version of this presentation. 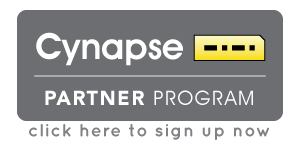 We have renewed the Cynapse Partner Program to help customers gain value from their investment in Cyn.in and are inviting partners to join in. The Cynapse Partners will work with customers to get them up and running on Cyn.in and assist with accelerating performance, provide guidance, training and support and cater to customer’s requirements. Adding Cyn.in to their portfolio, will help resellers and system integrators drive the benefit of SaaS and open source to their customers. ISVs and Solution providers can custom build addons to extend Cyn.in or integrate it with their applications and solutions to build a substantive offering for customers. While OEMs and product companies can combine Cynapse products as an offering with their software / hardware product to add additional value. Based on our trends for every $1 spent on software, there is a potential services revenue of $4. If you are looking for a Cynapse Partner near you, let us know of your requirements and we’ll connect you to the most suitable partners.